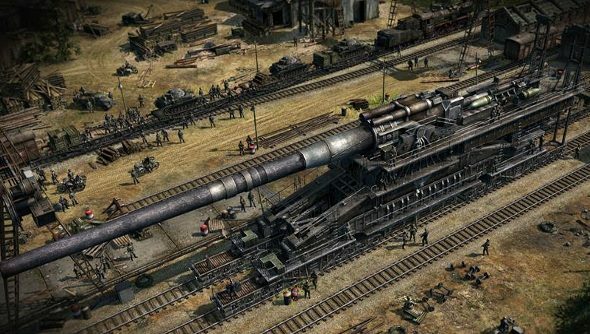 It’s been almost a decade since Nival dabbled in World War 2 strategy with Blitzkrieg 2. Since then, the studio has worked on Heroes of Might and Magic V as well as the iffy social spin-off for King’s Bounty, King’s Bounty: Legions. But now it’s returning to the front with Blitzkrieg 3, and it looks like there’s still life in the old war. The asynchronous multiplayer – which will be free, while you’ll need to pay for the single-player and mission add-ons – is a curious thing. There are two stages of a multiplayer fight: building and attacking. The building portion is leisurely, with players needing to construct stalwart defences and devious traps. When it comes to attacking, players will face the AI defences of their foe, not another player. It all sounds not unlike a single-player mission, but one where another player has created the obstacles and strategic puzzles. There’s an abundance of life on the maps that you don’t normally see in strategy games, too. Civilians work away, minding their own business, while troops perform their duties, building fortifications, making repairs and getting yelled at by superiors. And it looks rather lovely, too, if you like tanks, mud and ramshackle buildings. Blitzkrieg 3 is due out early next year.